Back in 2013 the “Bulking Diet” craze reached fever pitch. Everyone I talked to was touting bulking diets as the best meal plans for building muscle mass, fast. Eat a load of food every day that surpasses your basic daily calorie requirements. In other words, stuff your face with a surplus of calories and watch the scales climb, without concerning yourself with putting on body fat. Men and women in gyms were “getting big” and gaining muscle with this diet plan. In fact, it was – and still is – a common way for professional bodybuilders to build muscle. A lot of bodybuilders go through periods of “bulking” where they increase body mass (muscle and fat), followed by a “cutting” phase where the excess body fat is burned off later. It’s a popular practice, but not a practical one for the average guy or girl looking to add muscle and get in shape. The thing is, pro bodybuilders don’t really care how they look most of the year. All that matters to them is how they look on competition week. Even if that means waddling around like marshmallow man for 10 months out of the year. But you want to a body that looks great year-round. You want to gain weight, but you don’t want to get fat, right? Today, people want to look lean, shredded, ripped, athletic, and muscular. It’s encouraging to see more and more people opting for “Lean Bulking” or “Clean Bulking” diet plans, which are the best way to build lean muscle mass through nutrition. Those bulking diet plans sure moved the needle, but caused people to get fat as hell in the process. They’re a far cry from the best lean bulking meal plans for gaining muscle while staying in great shape. If anyone ever told you, “Eat big to get big,” they were right – and very wrong. Indiscriminately stuffing one’s face day after day can cause even the hardest of hardgainers to put on mass. I mean, anyone can gain 20 pounds of bloated fatty mass, but who wants that? It takes an intelligent nutrition strategy and optimized meal plans to gain dense lean muscle mass. Building muscle requires dedication and patience, not just in the gym, but also in the kitchen. If you want to add lean muscle mass to your frame without gaining too much fat, then you’re going to have to get the right meal plans in place. Gaining strictly lean muscle tissue, without an accumulation of adipose fat is a challenge, since putting on muscle mass requires a larger than normal calorie intake, which if not controlled properly can lead to more gains of fat than muscle. The thing is, when it comes to muscle building nutrition, more doesn’t equal more. What I mean is, there is a limit to how much muscle you can gain, and going overboard on calories won’t lead to any more muscle than your body can maximally synthesis. However, when it comes to fat deposition, more definitely equals more. Consuming a ton of excess calories will lead to a ton of stored fat. Unlike muscle growth that has a limit and stops, fat storage doesn’t – that’s why you need to adopt a “lean bulking diet” plan if you want to build lean gains in muscle. Before you start, you need to be critical about your current body fat levels. If you consider yourself as overweight, chubby, or have body fat over 16% then you’ll need to lean down a bit before starting any bodybuilding diet. Because if you’re currently fat, then a diet plan that creates a calorie surplus is likely to make you fatter. Plus, you’ll look like crap from start to finish. If you’re skinny, slim, lean, or around 10% body fat or less then you’re good to get started. You want to start this diet program off when you’re reasonably lean, and finish reasonably lean, with an increase in lead muscle mass. Now that’s out of the way, lets look at how you’ll go about creating these meals for building muscle – with minimal fat – by crunching some crucial numbers. Let’s get started creating your lean muscle building meal plans, shall we? The first step is to calculate your daily calorie requirements for building muscle. You can do this by taking your current lean body weight (lbs) and multiplying it by 17. Remember, you’re looking for your lean body weight, not your entire body weight. Let’s say you’re 185 pounds and you’re around 15% body fat. This calculation tells you that your carrying around 27 pounds of fatty mass. Next, subtract the weight of the fat from your total body weight. In this example, you’re around 158lbs of lean body mass, and this in the number we’ll be working with. Simply multiplying 158 by 17 (158 x 17 = 2,686) gives you a number of calories to consume each day. This should be a big enough surplus of energy to help build muscle, while small enough to keep fat storage to a minimum. Of course, this isn’t perfect (no such calculation exists), but it should work well for most people. The idea is not to be too aggressive with the surplus, but provide enough for recovery and growth, while staying lean. Now, I don’t know what number you’ve got, so we’ll stick with this example. Let’s say that you should be eating 2,686 calories per day to build muscle. Those calories are going to come from macronutrients – protein, carbohydrates, and fats, in the following ratios (give or take 5% either way). Here’s how to calculate your calories into grams per day. All you would do, is change “2,686” with whatever number of calories you need to be eating. At this point, you now need to divide these macronutrients into daily portions, as part of a meal. You can eat anywhere from 3 large meals, to 7 smaller meals each day. It’s really up to you, the important thing is hitting your numbers by the end of the day. With that said, to maximize protein synthesis and anabolism over the course of a day, consume a minimum of 3 meals spaced no more than 4 hours apart. It’s my recommendation that you eat 4 – 6 meals per day, as this is most optimal for growth. Ok, let’s meet in the middle and use 5 meals a day in this next example. Take your daily macronutrient totals above and divide them by 5. If that’s what you’re thinking, I’ve got good news for you. You do not need to be 100% accurate with this, it would be impossible to hit these numbers exactly, dead on, with each meal. And it’s not even necessary, you just need a rough guide to work with. Out of your 5 daily meals, some might have 30g or 50g of protein, and some might have 60g or 70g of carbs, and some might have 5g or 20g of fat. What matters most with this, is that you’re in a slight calorie surplus each day, and that you’re hitting as close to your daily macronutrient targets as possible. But you do not need to obsess over every calorie and every gram of protein, carbs, and fat. Simply consume foods within the region of your daily targets. 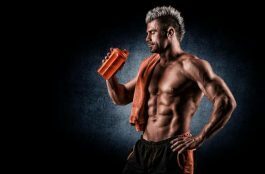 What follows in this guide is a list of the best foods you can use to build a great muscle building diet plan, and just after that you’ll find some ready-made example meal plans ranging from 2,000 – 4,500 calories. The example meals plans are just that – “examples”. You do not need to follow these generic meal plans exactly as they are set out. The purpose of the plans is to show you how to eat, structure, and layout your diet. They are there to guide you in constructing your own daily meal plans. We all have different likes and dislikes. Not everyone is going to like Salmon, not everyone is going to like Tuna, not everyone is going to like peanut butter. The meal plans are flexible. Everyone has different tastes, and some people have limited access to certain foods. For these reasons, you can modify the meals to your taste. It’s not going to make a difference to your results if you swap foods from the same food group, that has a very similar nutritional profile. For example, you could swap chicken for turkey, or oats for bread, or olive oil for coconut oil. If you’re changing foods, just make sure that your calories and macro totals remain pretty much unchanged. If you’re changing one lean protein food that provides 30g of protein, then make sure that your replacement food provides an equal amount of protein. More details about food preparation to follow. But first, let’s take a look at some of the best food choices for preparing a muscle building meal. One of the most common rules for protein is that for every pound of body weight you should have a gram of protein (this may also equate to 35% of your daily calorie limit). 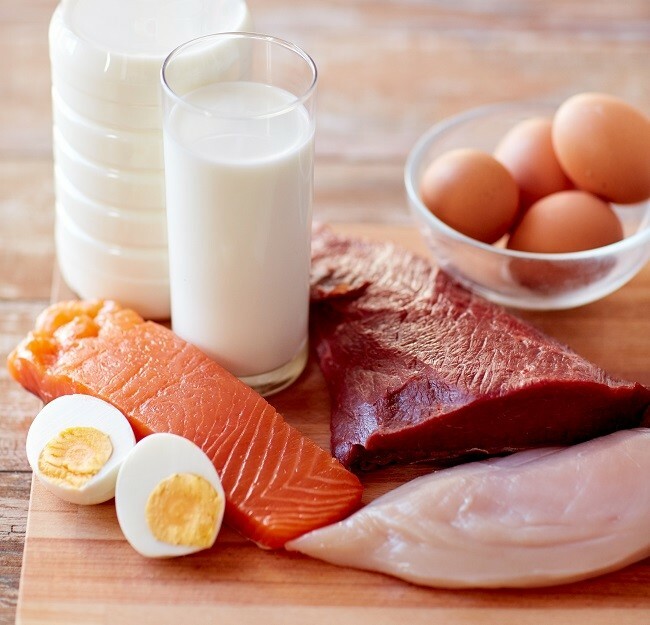 With this said, the body can only use so much protein at one time, meaning that it is important to spread it out over the day – most importantly, before and after working out. Be sure to stick with lean proteins such as egg whites, fish, white chicken and turkey mean, and whey or soy isolate supplements. These are high in protein and low in fat. But this does not mean that fat and carbs should be neglected altogether – in fact it’s the opposite; these are just needed in different amounts at different times, such as breakfast and post workout. Since carbs are responsible for providing your body with the energy needed to complete a workout, the intake levels should be adjusted on a day to day basis. On off-training days, scale back on the carbs since your body will not be as dependent on them to perform. Always try your best to avoid simple, or “sugary”, carbs and stick with whole grains, fruits, and veggies. 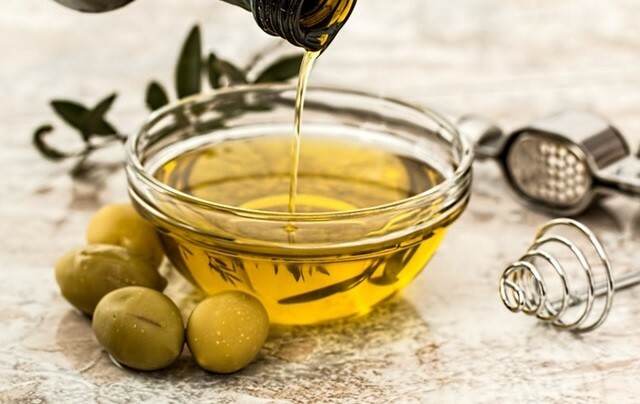 It is important to understand that there are many different fats and that healthy fats are not to be among the others when considering a diet for lean muscle. Healthy fats may come from organic oils and nuts and help absorb vitamins in the body while also regulating hormone production. In addition, healthy fats reduce inflammation, increase heart health, and lower blood cholesterol. Each meal should have between 5 and 10 grams of poly or mono-unsaturated fat. The example meal plans found at the bottom of this page range from 2000 – 4500 calories, complete with optimal 35% protein / 45% carbs / 20% fat macronutrient ratios for building muscle. I’ve just showed you the formula for calculating your calories and macronutrients, and a list of the best muscle building foods, including their nutritional profiles. Use this information to construct your own custom breakfasts, lunches, and dinners, or make modifications to the example meal plans provided in this guide. Once you know how many calories you should be eating each day, choose a mail plan that closely matches your daily requirements. It’s unlikely that the number of calories you need will precisely match the meal plans. For example, a man with a lean body weight of 152 pounds might have a daily calorie requirement of 2800 calories. In his case, he would take the 2500 calorie meal plan and increase some of the foods across one or two meals, or choose a 3,000 plan and reduce some foods. Simply adding one slice of wholemeal bread and one large egg to the 2500 calorie meal plan would bring the number of calories up to around 2750, ideal for our 152lb man. Make slight adjustments if your calorie needs don’t match the plans. Important Note: As I mentioned at the start of this guide, you don’t need to stress about getting your calorie requirements dead on. It would be impossible to be 100% accurate with this whole process. 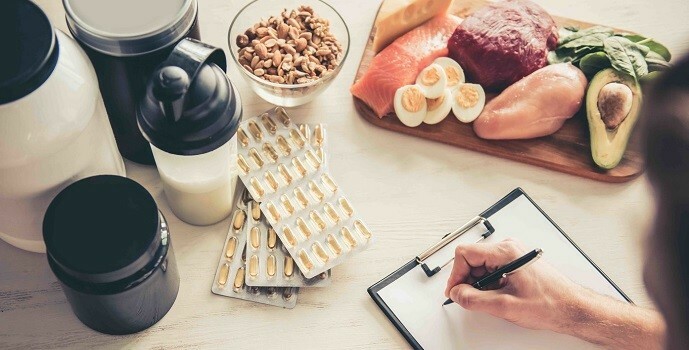 Your goal with your daily nutrition is to create a slight surplus of calories to facilitate the muscle building process, and to ingest ample doses of protein throughout the day to increase protein synthesis. The carbohydrates and fats provide an energy source and aid these growth processes. Don’t like some of the suggested dishes? Each meal listed in the plans is optimized for building muscle and shows the type of foods and quantity to eat, but does not provide recipes or cooking guidelines for each meal. There are simply a list of foods and quantities to eat for each meal, but it’s your choice to prepare each meal to your taste preference. You can cook the foods and eat them plain, but this could become quite boring, making it a struggle for you to stick to the daily nutrition goals, so add some flavour to the foods if you wish. For example, meal #3 in the 2000 calorie meal plan is chicken breast and brown rice. There are lots of different recipes for chicken breast and brown rice. You could make a chicken curry, stir-fry, or any kind of flavoured meal with these foods, it’s up to you. Meal #5 of the 3,500 calorie meal plan is lean ground beef and sweet potato. Don’t like sweet potato? – swap the sweet potato for white rice and make chilli con carne with the ground beef. You see, the meals can be enhanced with flavour and foods swapped around to suit your taste. Add seasoning, spices, or sauces to enhance the flavour of your otherwise bland dish. Eggs are another very versatile food that is used a lot in this nutrition plan. When you see eggs listed as part of a meal, cook them as you like – omelette, boiled, poached, scrambled or “Rocky Style” raw, choice is yours. Although, only eat eggs raw if they’re pasteurised. Maybe you’re a great cook… I’m not, so you may want to create your own daily diet plan from scratch. Looking at the meal plans provided will show you how a day of eating look’s, and how to structure a meal plan using around 35% Protein / 45% Carbs / 20% Fats macronutrient ratios. Adding sauces, spices or seasoning won’t knock the calorie and macronutrient profiles off by much, so feel free to cook the foods to your desired taste – make them edible. When constructing your own meals or looking at the examples provided, you may find that some food nutrition profile details differ when comparing to food labels. There are also some differences between the information found on food nutrition database websites and product labels. There’s no reason to worry about these minor differences, because the chances of every 100g of ground beef (or any food) having an identical nutrition profile is almost zero. The nutrition details of the meal plans in this guide, and all bodybuilding meal plans are accurate estimates. You don’t need to worry that your egg packet says 10g of protein per egg but one of my meals says 8g of protein. In fact, nutrition labels can be off by 20%, so you’re never going to be “bang on” – no matter how hard you try. I just have to cover this point because it’s amazing how many people get confused over this and unnecessarily obsess and stress over small discrepancies. Raw vs Cooked Weight: You’ll have also noticed that some foods are listed as raw weight and others cooked weight. This is for clarification so you know the nutritional profile of the food when you’re preparing your meals. 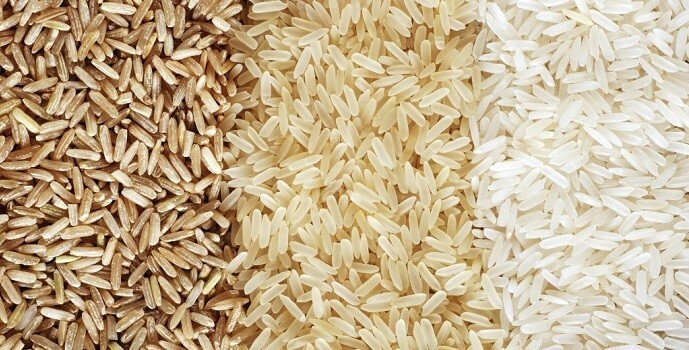 For example, oats and rice absorb a lot of water when cooked, so it’s easier to measure them dry. Chicken and other foods will lose water when cooked, so you need to bare this in mind when preparing your meals. I state the weight of the food listed as “raw” or “cooked” so you can see the calorie and macronutrient profile of the food in whatever state it’s in. As I’ve said, the meal plans are completely flexible. You can swap the foods around. Everyone has different tastes and some people have limited access to certain foods. If you can’t stand the taste of fish then change it for chicken or another lean protein source from the protein foods list. The same can be done with the carbohydrate and fat sources, but try to eat a variety of proteins and carbohydrates so that you’re getting a full range of amino acids, vitamins, and minerals. Remember to replace whichever food you are changing with an equal amount. For example, if you were changing Tinned Tuna for Pork Loin Steaks, you must make sure that the protein/carbs/fats content remains about the same. Food source providing 30g of protein must be replaced with another food providing around 30g of protein. Just another thing I must mention, do not pick a meal plan with excessive calories. For example, if you need 2,500 calories, don’t pick the 4,000 calories meal plan, you’ll just gain massive amounts of bodyfat and ruin any chance of improving your body! Remember, we’re trying to get away from the old “dirty bulking” and achieve an optimal state with these “lean bulking” diets. The meal plan you construct must closely match your daily calorie requirement using the number you got following the formula at the start of this guide. Do not think that massively increasing your calorie consumption is going to lead to more muscle, it’s not! Stick to the optimum range of calories per day. After 3 months of consistent training and nutrition, take your lean body weight again and re-calculate your calories. Remember, just like you progressively increase the weight over time as you get stronger, you make small progressive increases to the number of calories you eat over time as well, as your lean body weight increases. You now have the best muscle building meal plans and diet guide to start lean bulking your way to the body you want.